The clubhoose o the R&A. 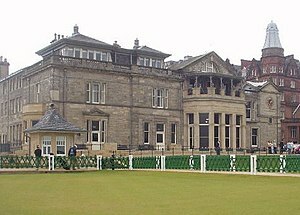 The Royal and Ancient Golf Club of St Andrews is ane o the auldest an maist prestigious gowf clubs in the warld (the auldest bein the Honourable Company of Edinburgh Golfers at Muirfield). It is based in St Andrews, Fife, Scotland, an is regardit as the warldwide "Hame o Gowf". ↑ "Pinehurst And St. Andrews Form Lasting Bond". Pinehurst Resort. 11 April 2005. Retrieved 27 August 2012. This page wis last eeditit on 10 Mairch 2013, at 09:37.